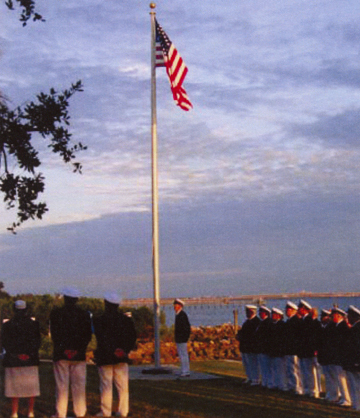 The Sundown Ceremony is performed at yacht clubs around. Your club decides when they will perform this ceremony. Some clubs do it on a regular basis, others on special occasions such as patriotic holidays or in conjunction with club events such as the Change of Watch. How the ceremony is performed is up to your club. Below you will find a suggested outline which can be changed to fit your club. We strongly recommend that whatever format you choose, you hold a rehearsal, especially when it comes to folding the flag, the use of music and the use of your clubs cannon. Click this button to read the history of the Sundown Ceremony. Click this button for an outline of the Sundown Ceremony. Click this button to download a music file (WAV) of the Assembly (Bugle) Call. Click this button to download a music file (WAV) of the National Anthem. Click the button to download a music file (MP3) of Retreat (Bugle).